Funding the fit-out of an office block in Cork to facilitate its acquisition by leading multinational pharmaceutical firm, Eli Lilly. The project is expected to complete in June 2014. The letting of 120,000 sq. 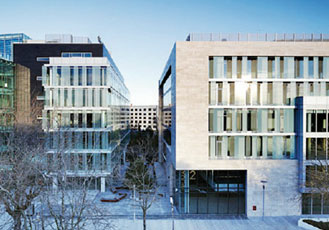 ft. in Dublin's Grand Canal Square office development to Facebook for its European headquarters. Facebook is now expected to increase its workforce in Ireland to some 1,000 staff. There have also been a number of other significant leases agreed in Grand Canal Square including leases with one of Ireland's leading law firms and with an international professional services company. Additional major lettings are expected to be agreed in 2014 for the remaining available space. 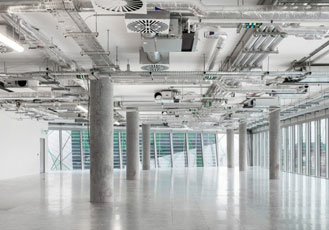 Interior floor shot of 4 Grand Canal Square post NAMA- financed landlord fit-out and prior to tenant fit-out. International broadcasting group BSkyB Group signed a 10-year lease for one and a half floors of the property. NAMA provided €1.5m in funding to fit-out the property for the new tenant. Global e-commerce firm Amazon agreed a 20-year lease for three floors. NAMA provided €1.7m in funding to fit-out the space for the new tenant. US digital company Adroll Advertising has established its European headquarters at Burlington Plaza with the agreement of a 10-year lease for a floor. NAMA provided €300,000 in funding to fit-out the property for the new tenant. Burlington Plaza, an office development in Dublin 4, which was vacant when the loans associated with the development transferred to NAMA and is now occupied by a number of high-profile international tenants. In addition to NAMA's development funding which was outlined in the previous section, NAMA is directly supporting 15,000 jobs in Ireland in trading businesses linked to its loans through the provision of working capital. These include jobs in property, hotel and leisure, retail, healthcare, manufacturing and agriculture. In December 2011, NAMA introduced a rent abatement initiative to deal with cases where tenants of its debtors can demonstrate that the rents payable under their current leases are in excess of market levels and, as a result, that the viability of their businesses is threatened (Guidance Note on Upwards Only Commercial Leases is available on www.nama.ie). The initiative enables tenants, in such circumstances, to seek NAMA's approval for rent reductions. To date, NAMA has received 339 applications for rent abatements from retailers; only 10 applications have been refused. The aggregate annual value of abatements agreed to date is in excess of €20m, which is the rent due to NAMA that it has agreed to forego in order to help businesses to survive. In addition, NAMA has agreed long-term reductions worth over €40m to help small and medium businesses in the retail sector. The objective of agreeing rent abatements in the first instance is to support the short-term viability of small and medium businesses which are intrinsically viable but which are experiencing difficulties arising from current economic conditions. In cases where there is genuine hardship which can be ameliorated by rent abatement, NAMA achieves two significant benefits. Firstly, it helps to preserve the value of the collateral supporting NAMA loans by ensuring that tenants remain in business and continue thereby to generate rental income. Secondly, it safeguards jobs and economic activity. Any short-term loss of rental income arising from rent abatement is likely to be more than offset by these long-term benefits. The initiative is not designed to confer benefits on businesses that are trading profitably or that are part of trading groups which are in a position to honour their current contractual arrangements on rent.